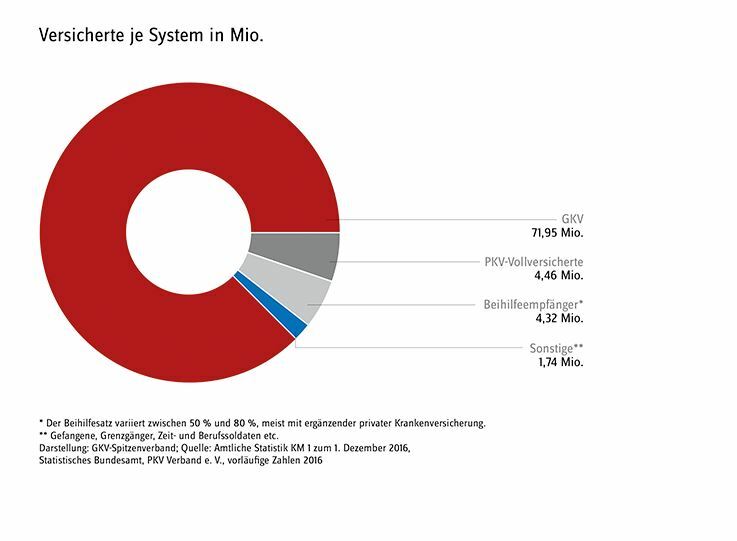 In Germany, around 70+ million people are insured by a statutory health insurance fund (Krankenkasse). Statutory health insurance in Germany works on the principle of solidarity: all members of a statutory health insurance fund are entitled to medically necessary treatment – regardless of the level of their health insurance contributions or their income. It also covers all existing medical conditions. Family members without an income of their own are jointly insured under the statutory health insurance at no extra cost. Although under statutory health insurance, 95 percent of the services are set by legislators, health insurance funds can offer their customers additional services. As a result, there are differences that may be of interest to specific groups (for example diabetics, asthmatics or young parents). A comparison of services can therefore also make sense even within the statutory health insurance system. There are significant differences between the individual statutory health insurance funds with respect to special services, bonus and selective tariffs as well as customer service. For expats, the most common question is whether they qualify to become a member of a statutory health insurance fund or not. For expats of any nationality arriving from another EU member country where they were previously insured in the state system of that country (for example the NHS in the UK), this is generally unproblematic. However, there is just a 3-months-long window of opportunity when you take up your residence in Germany to apply for voluntary membership in the German public health insurance system. This is unfortunately a typical mistake made by many that this chance to join the public insurances in Germany is lost for lack of a timely application. Therefore please ask for professional advice and assistance the moment when you take up your residence in Germany. This also applies to expats arriving in Germany to work as an employee and who either earn in 2018 less than EUR 59.400 EUR per annum or 4.950 EUR per month (both gross) or who are employed in Germany for the first time. Unless you are over 55 years old…. in which case you might not get into public insurance either. For freelancers or self-employed arriving in Germany without having been previously insured in the state health insurance scheme of an EU member country for the previous 12 months (or 24 months in the previous five years), joining the statutory scheme is usually not possible at all. Where it still would make sense to join a statutory fund in such cases (e.g. because of pre-existing medical conditions or large families that are best jointly insured), there can be options, but this is not simple and may require extensive consultation. Another field that is not simple is that of academics and students over the age of 30 who are supported in Germany by scholarships, for example. Special insurance solutions are required here too.